Zoe Whalen is a connoisseur of the soft and pastel. A recent graduate out of FIT, Whalen has been making waves with her work, which feels like a dreamscape where you can get lost in a warm pile of lace or a floral print. Whalen graciously sat down with us to discuss her first NYFW show, Morris, and the inspiration for its unique aesthetic. What was it like to organize your first NYFW presentation? Organizing my first NYFW show was a blur. It felt like everything might fall apart at the seams at any moment, but it also brought forth this entire support system I have in the art and fashion scene in New York, which was magical and heartwarming. How did your design of the space play in to the way your collection was presented? The presentation was in Stream Gallery in Brooklyn, a tiny hole in the wall across the street from Birdy's, pretty well into Bushwick. I transported basically all the furniture from my own living room to make it feel like a fucked up home setting, with sheets and fabric draping [to create] a maze through the small space. The only lighting was from neon orange lights, loaned to us by Nitemind, and a glitching 90's television. Only about two or three people were allowed in at a time to maintain an immersive and intimate setting. I cast the presentation through mutual friends and instagram primarily. I wanted to convey the diversity of the country and the fashion community. To keep the process as inclusive as possible, anybody who was interested and excited was welcome to participate. We didn't really have the traditional casting call, just fittings that almost felt like kick backs with old and new friends. You cast people of all genders in the show—was this somewhat of a conscious choice to queer the narrative of the "housewife"? In light of the recent events in the country, I used my own middle American heritage as a catalyst for the collection. I tried to reimagine the outdated, heteronormative and exclusive version of America, the one that generations of my own family helped to create. I set out to find beauty in my own discomfort and create a genderless femme dreamscape using mainstream 20th century aesthetics. The collection ultimately became a tribute to my Great-Great-Grandmother Morris. She was an amazing seamstress who lived in Arkansas and Oklahoma and used her talents to dress nearly everyone on my dad's side, but never gained any recognition for her work outside of her own family. 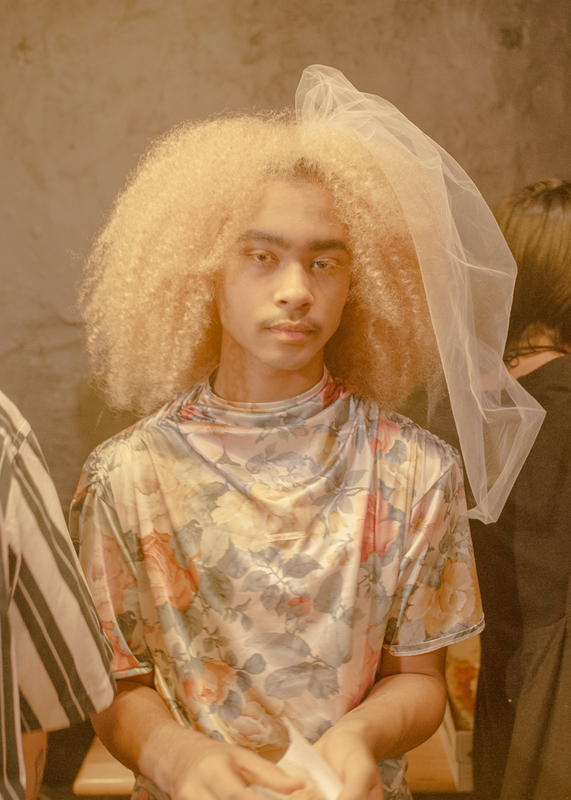 I used mostly sheer layers as symbolism for the complexity of identity and heritage, outdated floral prints sourced from Amish country and frilly silhouettes based on family photographs. I tried to use a combination of clothing, casting, and an intimate set to portray a message of inclusivity and comfort within a distorted nostalgic lens. I'm currently taking time to explore the European fashion industry, with a studio based out of Paris and plans for a third collection in the works. I'm unsure if I want to stick to the traditional fashion week calendar, but an event in February would not be totally unexpected.